CONTRA DANCE IS NEW ENGLAND-STYLE FOLK DANCE. 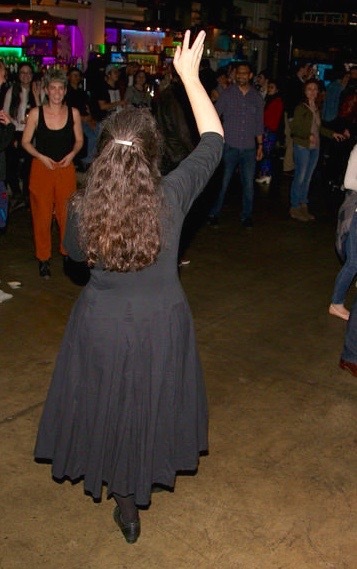 Celia Ramsay has been calling Contra dances since 2002, but has been telling people what to do for much, much longer. Celia chooses dances that fit the people in the room, uses clarity and brevity in teaching, and has a warm personality that makes the dancers happy. See where she's calling next! DO YOU WANT TO HOST A DANCE? Book Celia to call a dance for you! Celia can call Contra Dances, Scottish Ceilidh Dances and Family Dances. The latter two include simple dances suitable for all ages, and can be fun for fundraising events, weddings or celebrations of any kind. She'll find the right band, and make recommendations on sound and location needs. If you are considering a dance for your special event, please talk to Celia first, because she has valuable experience about how to make your dance a success; if she’s unavailable, she has other callers to recommend.